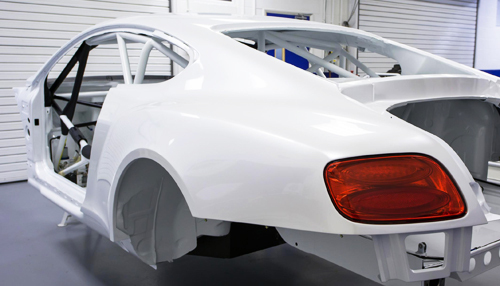 Whatever the results produced by the team consisting of Bentley racing, M-Sports Ltd (technical support) and the workers at the assembly plant in Crewe, it will deserve an A for effort. The Bentley GT3 Racer Concept debuted at the Paris Auto Show last year, and was based on the iconic Continental Grand Tourer, but is evolving thanks to rigid dedication to the racing genetics developed across the last century. Notably, Gush was the last man to take the company to victory in a Bentley racer during Le Mans in 2003. The effort started in the right place by reconfiguring Bentley's high output 4.0-liter twin-turbo V8 engine, coupled to a six-speed sequential racing gearbox. Next, they’ve added double wishbone suspension, four-way adjustable dampers and competition brakes to the chassis system, cutting more than a ton of fat from the Continental GT road car. This was done by removing all the parts and equipment that make the road car so conspicuously luxurious – including ECUs and numerous electrical systems extraneous to the racing game. Even the Continental GT doors have been replaced by racing versions, weighing an eighth as much as its street legal cousin’s. What hasn’t changed is the exhilarating silhouette of the road car, though the doors, trunk lid and hood are handcrafted from carbon fiber. A roll cage, conforming to FIA specifications, has been added to the body to more than double its rigidity. Similarly the drivers seat is molded from carbon fiber and exquisitely trimmed and seamed by the skilled workers at the Crewe factory, along with the racing steering wheel and door pulls, just like a Continental GT road car. The Continental GT3 will soon begin pre-race testing and further details and specifications of the Continental GT3 will be released soon. Even if Bentley doesn’t win its next race, its presence will further validate the winner’s accomplishment. Should Bentley win again, it’s something that has been a long time gone, not to mention a long time coming, as well.